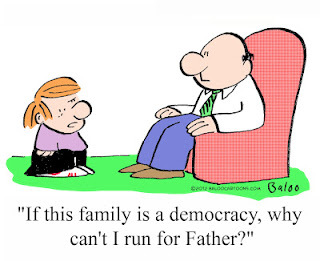 There are all sorts of definitions of democracy. For example, "the ​belief in ​freedom and ​equality between ​people, or a ​system of ​government ​based on this ​belief, in which ​power is either ​held by ​elected ​representatives or ​directly by the ​people themselves..."
Many definitions suggest that a characteristic of democracy is: "freedom of speech and press...."
Twenty or more years ago, before debates about climate change had overtaken discussions about democracy, much of the discussion about what democracy was and how it manifest at local level, concentrated on the idea of the climate of democracy. Which is a way of thinking about the civic culture that exists in a community - how it develops and what fosters it - so that the community is predisposed toward, or educated to accept and expect, democratic processes and political activities in public life. This idea is that democracy cannot be imposed by laws or treated as a social add-on. That it is built into society and its institutions and becomes a conscious and maintained state of mind of the people. Some western democracies build it into the school curriculum, so that students leave school with a grounding in civics and an understanding of politics and that it is normal for people to hold different values from each other requiring processes, negotiation and understanding to reach jointly agreed decisions. I accept that not everybody wants to involve themselves in public minded activities and processes. Life's too short, they might say, and prefer to concentrate on their own individual pursuits and objectives. It has always been thus. But I think we have seen a number of structural changes in Auckland that are causing its climate of democracy to fail putting at risk its ability to act for the common good, in the public interest, whatever that might be. When I was first in local government - councillor on North Shore City Council, board member on Devonport Community Board - I gradually came to understand how local democracy functioned here, and the role it performed in maintaining the local climate of democracy. Most meetings were attended by reporters from the North Shore Times Advertiser (NSTA). Local issues were extensively reported. Councillors were named and shamed. I remember how anxious councillors would become on NSTA publication days. They wanted to see how they'd been quoted, what angle the reporters had taken. And these newspapers were very widely read, but often not by the section of the community busy with their own lives and objectives. The impression I gained was that the avid readers of the NSTA were the ones who voted in the local elections at least, and were often the "go to" people in the community for others wanted some guidance on who to vote for. School projects focused on local issues that became hot topics: sewage on beaches, cycle lanes, public transport, recycling, water demand statistics. Students would phone councillors. Take clippings from the NSTA. Debate the issues with their parents. All of these activities fostered what I'll call North Shore's climate of democracy. And this is what we are losing. Local government amalgamation, centralisation and corporatisation has pretty well gutted local communities of the nucleus of local democracy. The same issues exist, but without that institutional focus, local communities are disempowered and their ability to make a difference reduced. The NSTA still exists but its utility is diminished by the loss of local government purpose. Many resort to individualism which is understandeable, but given we are a species that has adapted to working successfully in groups, we are unlikely to be as successful as we could be working more collectively on shared problems. It is interesting to reflect that free speech and a free press is seen by many as an essential component of a thriving democracy. It is OK to walk down to your front gate and voice your concern for all to hear who open their front doors to listen. Previously you could go to community forums and vent your spleen, get a few nods of agreement, and if there was merit maybe even lead a change. Increasingly individuals resort to facebook (or even a blog) to express themselves. Which brings me to the role of a free press in a democracy. Newspapers of record - that reported most of the important decisions or issues of the day - form an essential part of the body politic of a local democracy. Reports, opinions, think-pieces, investigative journalism, letters. All of these components would be contained within those pages. Not friends sharing with like-minded friends, but a diversity of views and ideas and stories and articles. It is the range and breadth that we will lose in Auckland as NZ Herald quietly divests itself of writers and reporters, and as the pages of the newspaper shrink in content and devolve into an expanded stuff.co.nz. That's why I think Auckland's climate of democracy is failing. And it will need to improve to develop the sort of conscious and engaged communities that will be a pre-requisite to an educated, engaged and organised response to atmospheric climate change on the one hand, and to changes in urban form on the other. Is Council's policy of non-notification leading to future budget blow-outs at best, or future bus commuter health and safety hazards at worst...? There's been a couple of recent hearings relating to the Precinct Properties and Auckland Council PPP in downtown Auckland (The one with the new tower, proposed partial Queen Elizabeth Square sale, CRL enabling works, and shifting a bus terminal from Lower Queen Street to Lower Albert Street). The first was a hearing of objections to Auckland Transport's proposal to "stop" the road status of the part of the Queen Elizabeth Square proposed for sale, and the second was Precinct Properties private plan change 79 to change the zoning of the part of the Queen Elizabeth Square proposed for sale from public open space to zoning more conducive to private development. The latter hearing was covered by Bob Dey here, here and here. One of the issues many submitters raised at the hearing related to laneway width proposals worked out and modelled by Precinct Properties working with Auckland Transport. I posted about this issue here. This demonstrates that using Fruin's formulae (Fruin is the acknowledged expert) and his approach to modelling commuter pedestrian flows in corridors, that to safely move an average of 10,000 people per hour, the corridor needs to be between 8.3 and 8.9 metres wide, when the corridor is lined with shops. 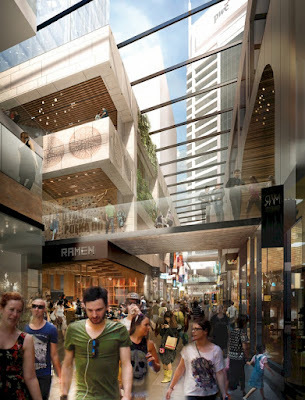 This is Precinct's architectural rendering of the proposed east west laneway - a narrow 6 metres wide and connecting Lower Queen Street with Lower Albert Street. The section of the laneway (proposed to be available 7/24) from Lower Albert Street to the current western edge of Queen Elizabeth Square is about 60 metres long. 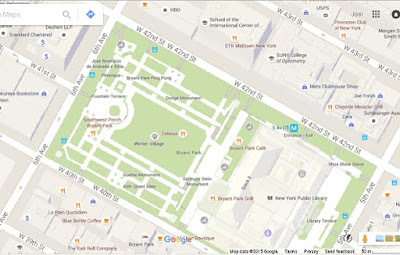 It is intersected with a small dog leg lane running north to south (which is not 7/24), and, as the image shows, is lined with various retail outlets. What I have discovered since the hearing is that Auckland Transport must have been using the same Fruin formulae when it did the modelling with Precinct Properties, but it came up with a figure of 6.5 metres based on a "conservative" flow rate peaking at 16,000/hour. Interestingly, Fruin suggests that an average of 10,000 per hour would include a peak flow, which he suggests would mean that 40% of the 10,000 might go through the corridor in just 15 minutes. For those of you mathematically minded, this means you have to do a sum where you divide 0.4 by 0.25 (40% of the pax in a a quarter of the time), giving a multiplier of 1.6. This ratio, x 10,000, gives 16,000, the "conservative" rate. But in this case Fruin carefully distinguishes between moving pedestrians through a corridor without colonnades, shop fronts, and side entry-ways - from a corridor (or laneway) that is lined with shop fronts etc. I believe that Precinct Properties have been mis-advised by Auckland Transport. The proposed 5 metre wide (or 6.5 metre wide - with 0.75 metres on either side of a "free" 5 metre wide passageway), will not be wide enough to safely allow the passage of 10,000 pedestrians per hour through its shop-lined laneway (which is really just an arcade - laneways are quaint, open to the sky, cobbled, crooked....). Which raises several interesting questions. The Plan Change 79 hearing ONLY relates to the bit of laneway that would be built through the part of Queen Elizabeth Square that is proposed for sale. A section about 40 metres long. The other section, the 60 metre section, has ALREADY been consented in June this year. At that time a non-notified consent was granted for this 60 metre section of 5 metre / 6.5 metre laneway. Which, as I've explained, according to the experts, will not safely allow the passage of 10,000 pedestrians per hour. I surmise that because the June hearing was non-notified, and because there were no submissions about the laneway, then the particular matter of corridor width was not an issue for the commissioner considering the application. I am not aware of what evidence or information was available to the commissioner at that hearing supporting the application for a 5 metre/6.5 metre wide mass transit access corridor. What can you do with a permit that allows a public pedestrian hazard to be constructed? One of the reasons officers would have used to justify non-notification of Precinct's June application would have been that it was largely based on the previous consent obtained by Westfield for the tower and mall redevelopment (which is examined here and here), and which was purchased by Precinct Properties when it purchased Westfield's interests in the downtown site. However the situation and context had changed from when Westfield obtained its permits because more detailed information existed related to proposals to shift the entire Lower Queen Street bus terminal into Lower Albert Street. This information better quantified the impact or requirement of the proposed laneway serving as a critical link in Auckland's CBD passenger transport terminus and interchange. However it seems to have had no impact or effect on the laneway plan. Which is now consented. What a cockup. This awkward and poorly planned situation closely resembles, and was influenced by, what happened when Westfield applied for consent for its tower and mall redevelopment in the first place. At the time ARTA (Auckland's then Passenger Transport Planning Agency), raised concerns that the basement parking and foundations of the proposed tower would interfere with the proposed Central Rail Link tunnel. However Auckland City Council ruled that ARTA had no standing because it could not designate the route. ARTA was not even able to make formal submissions relating to proposals to put bus interchange facilities in Lower Albert Street. Auckland City Council proceeded with the application on a non-notified basis. This has subsequently meant that Auckland Council was forced to pay through the nose compensating Precinct when it finally got round to designating the CRL route. It also meant, because ARTA was not able to be properly involved, that the matter of the safe laneway width was not dealt with at that time either. Looks like the CRL compensation history might repeat. This time, because Precinct Properties has been permitted to build a narrow and unsafe laneway, Auckland Council and Auckland Transport will have to figure out and pay for an alternative that allows public transport passengers to interchange modes and to directly access their destinations. Or maybe they'll just do nothing. Auckland CBD public transport passengers will have to put up with poor planning and figure out alternative, safer and less congested routes. Or maybe they'll just close the laneway if it looks like too many people are using public transport. And by the way, the 10,000/hour commuter pedestrian flow figure is not a lot different from today's patronage data. Shouldn't we be planning public accessway infrastructure capacity that will meet the needs of a growing city population, with an increasing public transport mode share? And all because significant applications are not being publicly notified. I write this brief report in New York. I was invited to attend this International Workshop because of my university research on public space planning on Auckland and Wellington waterfront land. The workshop was attended by academic and expert geographers, anthropologists and urban planners from France, Austria, USA and New Zealand (moi). Title: Understanding Public Private Partnerships: governance, urban development and spatial justice. Held at City University of New York at the CIRHUS - Center for International Research in the Humanities and Social Sciences, sponsored by CUNY-CPCP and Metropolitics/Métropolitiques. The intro to the workshop reads: "As cities have adopted the entrepreneurial turn (Harvey, 1989), many urban interventions initiated or encouraged by public authorities rely on the financial capacity and the know-how of both for-profit and not-for-profit private interests to (re)develop land. Presentations will examine public-private partnerships that contribute to the development of ostensibly public space, the creation of urban amenities as well as the formulation of urban design aesthetics and production of architectural quality..."
Professor Elliott Sclar was the discussant. The morning was allocated to a series of 15 minute presentations (very tightly managed! ), then discussion. After lunch a smaller group concentrated on the mechanics of producing a journal issue on the workshop. The presentations were attended by a much wider group of academics and practitioners. I won't go into detail here, but just a few highlights. Phil Berge-Liberman from University of Connecticut kicked off talking about "Conservancy Park" planning where private investment in parks maintenance and development increasingly gives the investors the right to determine "proper use" of the park, and to introduce ideas like "the landscape has rights too". He described in detail the amount of private money that now goes into New York's Central Park - with ideas like "adopt a tree" and suchlike to the extent that investment now shapes the way it is used. Large "political" gatherings are much less likely. Many behaviours are prohibited. 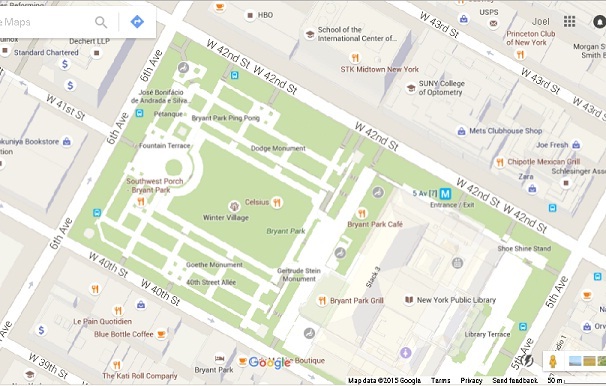 He produced statistics that showed in 2009 the park added $17.7 billion in value to properties adjacent to the park. One throw away line he used, "the difference between parks in working class neighbourhoods and wealthy ones, is that the first are brown - because they are used so much for football and basketball, and the others have much greater tree canopy and green - because they are hardly used at all by comparison. Yvonne Franz from Austrian Academy of Sciences spoke about residential PPPs in Vienna, what she described as "social democratic city", operating in compliance with the "EU Stability and Growth Pact" - which she didn't really explain, but sounds similar to what's happening in NZ, where Central Government imposes its growth targets on Auckland Council and Auckland. Apparently Vienna (which is not a big city) is building 8,000 to 10,000 new apartments per year. Her concern was the fact that private investor is not interested in schools or kindergartens. She described it as "single project thinking". Lack of integrated planning. She described "under-utilized open space semi-private park spaces". Her concern was that this results in "limited sharing practices", and for connecting. Her work suggests there needs to be thinking and design about "interaction between generations" - to "create social mixing amongst new and existing residents". What also struck me about Yvonne's talk was that the carrot of "affordable housing" is used to get political and public sign-off of PPP residential projects, but there is little effort put into ensuring those numbers get delivered and are protected. (Invokes in me the thought of how often in Auckland the carrot on the waterfront is public space - and how frequently it is either not delivered, or that it is taken away and privatised). I compared public space outcomes at Auckland and Wellington - under the same statutory environment, yet so very different in quality - and provided an analysis of the reasons for those differences. And finished with an account of what is happening now in downtown Auckland. The risk that public space will be appropriated in the interests of the deal that has been reached between Auckland Council and Precinct Properties unless third sector groups like Auckland Architecture Association, Civic Trust and Urban Auckland intervene in the public interest. This sparked response from visitors. Sclar suggested their action might be subversive. Another commented, "same as here, can't see daylight between the interests of municipalities and developers. Calls into question what you call public..."
You get the picture. I was among fellow travellers. Other interesting presentations followed. Lots of ideas shared. Will share more in the blog later. BTW - if love is the answer, what is the question? Or maybe, love is the answer to every question. Is that the theory? 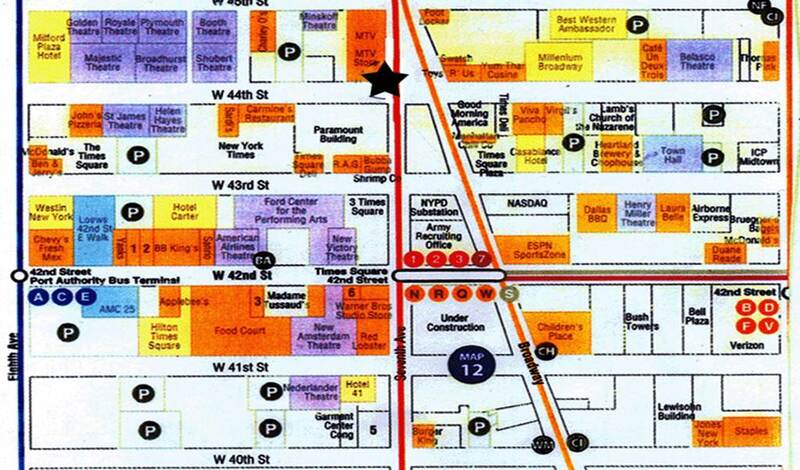 I was in West 14th, very near the MeatPacking District. Very trendy it seems. All along the route, you can see for-sale and to-let signs. Changing fast. People are changing their backyards to inter-relate with the Highline. Something they turned their backs on, has become the main attraction. Just wanted to share this with you. This sign is at every entry to the Highline Linear Park. Quite exhausting and depressing to wade through. And very American. Reminded me of those immigration forms you had to sign you'd not recently been guilty of "moral turpitude". Maybe that's why I never saw an American on the grass in a park - not prohibited though! 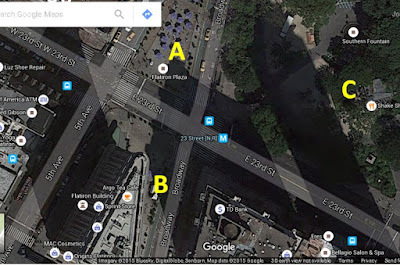 The first pic - below - is from "A", looking across E23rd toward "B". The time of year is November 15th, it is autumn, the sun is low, and tall buildings cast long shadows, sunny gaps between. Quite a lot of wind. (BTW - I've posted some video clips from this site, and from Madison Square. Got them the next day. Couldn't keep away). These people are in the sunny area, rugged up, tables and chairs are publicly available for anyone to sit at. Groups doing their thing. Eating lunch. Having a catchup. Very relaxed and in the heart of Manhattan. You might recall those images when - as an experiment - NY put deck chairs through Times Square. Well, now it's red tables and chairs. People put them where they want them. A lot of fun. Very public. Lots of individuals performing. Magnetic. 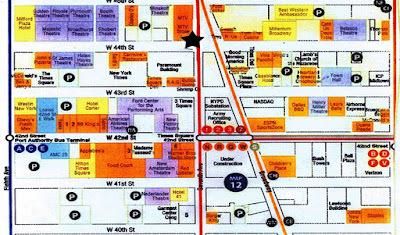 Precinct's Downtown Laneway: How Wide?